It is with great sadness that we announce the death of our long-standing, wonderful Musical Director and friend David Morris. The band are all devastated at the news. We know David loved Woodhouse Prize Band as much as we all loved him. He leaves behind a group of people who came together twice a week to make music but above all had fun and gained much enjoyment and friendship. His drive and commitment to improve the band was unquestionable along with the innovation for new ideas that he showed to our audiences. We will all be forever grateful. 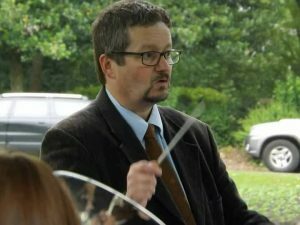 David has many, many other friends in other brass bands across the region and wider, all of whom will miss him dearly. Our close friends at Chapeltown Band, where David played on the front row cornet bench, are today feeling how we are. We stand together in grief. We will continue to grow from the encouragement and positivity you instilled in us. Our booked engagements between now and Christmas will be fulfilled, however, please bear with us during this time. All of our love and thoughts are with Caroline, Daniel and the family David leaves behind. Your band family will always be here for you.